6th February 2018, Manila - Chinese New year is the traditional festival in Asia, Family and friends will get together for celebrating this festival. Red Packets (formerly “Lucky Money”) is a way to send good wishes and luck. This year, EA wants to send the good wishes and luck to every player. 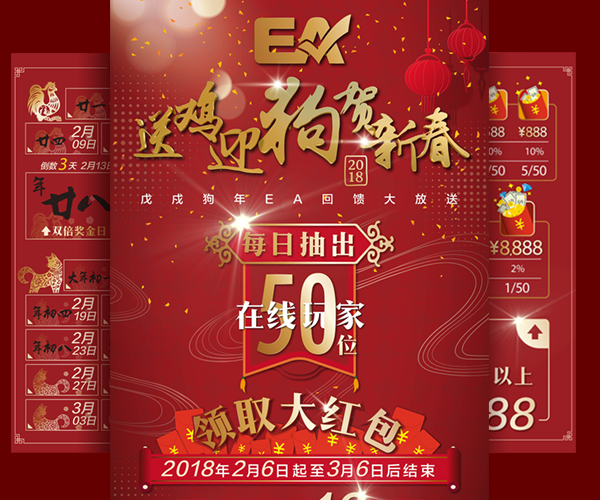 We launched an “EA Chinese new year promotion” from 06-Feb-2018 00:00:00 to 06-Mar-2018 23:59:59 (GMT+8). After this promotion, EA distribute 1450 red packets to different player. Total prize value is over RMB1, 260,800.